Jackson's school is hosting a Teacher Appreciation Luncheon in about a week and a half, and the parents and students were asked to prepare little trinkets, notes, pictures, letters of appreciation, etc. to be presented to the teachers at the lunch. As a former teacher myself, I always aim to make gifts that can be USED. I was directed to a website, www.familyfun.com, which is LOADED with tons of age appropriate, FUN ideas, and I thought, "What preschool teacher cannot use a towel?" There is always a mess to be cleaned up! We also made one for his music teacher, who he just ADORES, and one for Coach. This craft is very affordable once you have the fabric paint, you can buy oodles and oodles of dishtowels without breaking the bank! Excellent idea! I love it and I'm sure his teachers will too! and I'm going to copy the idea ! What a cute idea- love it! Love them. 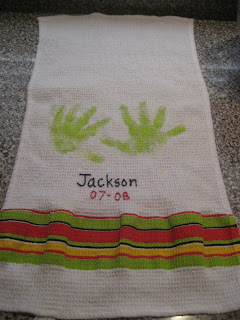 You know the teachers will be shocked that those are actually Jackson's hands!